Remember the taxpayer funded, promotional discount passed by the Democrats to sell Obama's Chevy Volts? Would it be a surprise to find out that dealers, not car buyers, are taking the credit and padding their cash flow by still selling the Chevy Volt at retail? The practice of dealerships purchasing from one another is not uncommon. "Dealer trades" are done all the time in the industry. What is very unusual is for the receiving dealership to be able to maximize profits at the expense of taxpayers by claiming tax credits of $7,500. It is also very rare for dealerships to part with any model that has higher demand than supply, as GM claims is the case with the Volt. In addition to qualifying dealerships for a $7,500 tax subsidy, the titling process also allows GM to record Volt sales even if the cars are sitting on dealership lots. While most of the dealerships offering "used" Chevy Volts for sale are Chevy dealers, I also found other manufacturers selling Volts with low mileage as "used" cars. A Kia dealership in California that I contacted seemed to suspect that they were doing something a bit underhanded when I called them to inquire about a "used" Volt for sale with only 30 miles on it. After I identified myself as being an associate with the National Legal and Policy Center, I was placed on hold. I was then told by a sales manager that the Volts offered at that dealership were rental cars with higher mileage on them. I later called the same dealership back posing as a potential customer and confirmed that a "used" Volt with only 30 miles on it was available. This also raises the question of why GM or Chevy dealerships would be selling Volts to other manufacturers' dealerships when they claim that there are not enough of the cars to meet retail demand. A Chevy dealer in Chicago was more upfront with the info given on a "used" Chevy Volt with only 10 miles on it. The vehicle was being offered at MSRP. When I asked if I was eligible for the $7500 tax credit, I was told that I probably wasn't since the dealership was applying for the subsidy. This practice is one of the more egregious abuses to date purloined upon taxpayers as a result of the GM bailout. 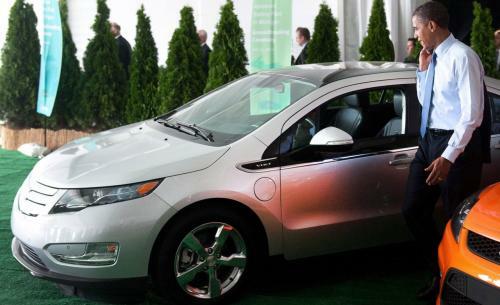 The intent (even if misguided) of the $7500 tax credit offered on the Chevy Volt is to encourage consumers to buy "green" vehicles, not to offer an opportunity for dealerships to game the system and maximize profits at the expense of the taxpayers. I also suspect many purchasers of "used" Volts will attempt to claim the $7500 tax credit for themselves, thus bringing the total tax subsidy on such transactions to $15,000 if not disallowed by the IRS. Of course, we aren't surprised. Just when was there a program that was not wrought with waste, fraud and abuse? This is why capitalism works and Obamanomics doesn't. The silent hum of an electric engine is quite similar to the sound of money being flushed down the toilet. Let's see, a government give away to promote the purchases of an overpriced government motors' electromagnetic lemon and it's wrought with abuse and corruption. Gosh, who would had seen that coming?